Why do I like the Hoover Linx cordless stick vac? Well, because it’s a Hoover and they are one of the most trusted manufacturers of floor care appliances on the market today. 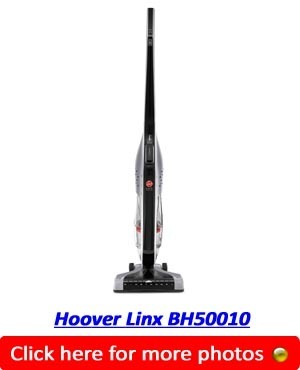 Their products are highly sought after and people looking for a dependable cordless vacuum cleaner often settle for the Hoover Linx Cordless Stick BH50010. This cleaner vacuums well, offers cordless operation, charges in a few hours, and has a wide cleaning path so that you don’t have to go over the floor too many times. However, with that said, those aren’t the only benefits that this stick vacuum cleaner has to offer. Let’s take a look at the Hoover BH50010’s features, pros, and cons so that you can make an informed purchasing decision. 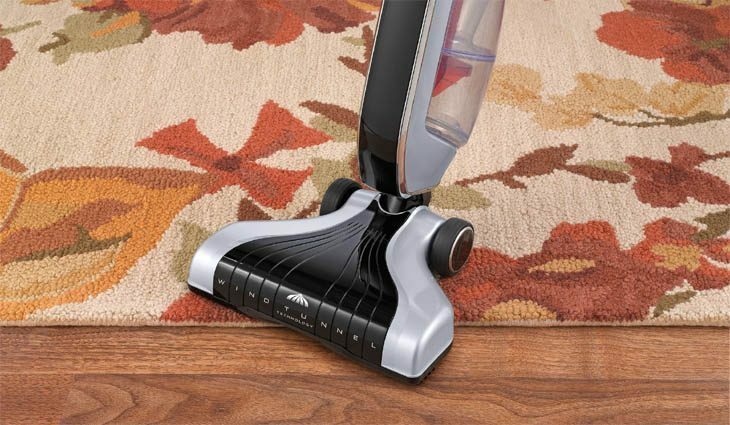 The latter cleaning mode makes use of the vacuum’s brushroll to lift up dirt that is embedded deep into carpet fibers. And thanks to the Wind Tunnel Technology, the Linx cordless BH50010 vacuum cleaner never loses suction no matter what surfaces you’re cleaning. Another feature that enhances cleaning of bare floors is the edge cleaning bristles. With this feature, you can be sure that the dirt around the edges of the floor will be gone after vacuuming. The LED indicator mounted on the front side of the vacuum cleaner displays a status bar that lets you know how much battery life is remaining. With the recline handle, it’s possible to reach underneath furniture that has a high floor clearance like tables and chairs. In addition, you can change between cleaning modes at the flip of a switch. Other controls are also designed intuitively into the vacuum cleaner to improve usability. When it comes to convenience, Hoover’s Linx cordless stick vacuum cleaner does not disappoint. Users will find much convenience in using this appliance because it’s cordless and comes with a bottom release dirt cup. Cordless operation is a staple feature in most stick vacuum cleaners and it’s a feature that will raise some red flags if it’s not present in any vacuum machine these days. With a battery-powered vacuum like the Linx cordless cleaner from Hoover, you can move freely without tripping over a cord while carrying out cleaning chores. You’ll also not have to deal with trying to find a power socket to plug in the vacuum’s cord in the midst of cleaning. When it’s time to empty the canister, you’ll know instantly due to the clear design of the dustbin. What’s more, you’ll not have to get your hands dirty when emptying the bin since it comes with an easy to use bottom-release dirt cup. One more feature that is absolutely superb with this stick vacuum is the automatic height adjustment. This makes it easy to clean surfaces regardless of how short or tall the user may be. The entire machine only weighs 7.5 pounds. This relatively lightweight construction makes it easy to transition from one room to another. For users who consider aesthetics to be an important feature in a vacuum cleaner, Hoover’s Linx cordless vacuum machine is not too boring to look at. It features a beautiful glossy silver and black finish adorned with some metal accents and of course, the iconic red Hoover logo on the front. At the time of this writing, the Hoover Linx Cordless Stick Vacuum Cleaner had over two thousand reviews on Amazon alone, with the majority being five star ratings. 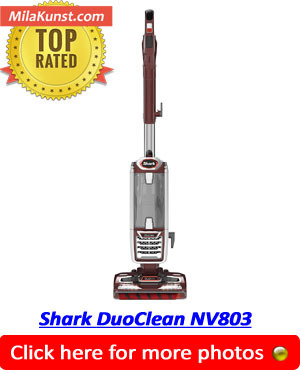 This model is one of the top selling stick vacuum cleaners in this category. A lot of buyers like this floor cleaning appliance for different reasons such as its light weight, strong suction, ease of use, and excellent performance on hard floors, area rugs, as well as pet sheds. There are a few complaints about the Linx cordless stick vacuum though, such as its short lived battery life and lack of a stair handle. While other users also did not like that some parts like the brushroll breaking off after sometime, the chances of malfunctions largely depend on how well you take care of your vacuum cleaner. The good thing with this unit is that it has a compact construction that can stand the test of time. In spite of the few cons that come with the Hoover Linx Cordless stick vacuum cleaner, it’s a great appliance for small to medium sized homes that do not require a lot of heavy duty cleaning on a regular basis. This vacuum delivers reasonable value considering its price tag. In addition, it does a great job on both carpets and bare floors, is easy to use, and has plenty of functional features. If you’re considering getting this cleaner, it may be a good idea to stock up on a few extra batteries. This could double or triple your cleaning time per session. Overall, this is a pretty decent stick vacuum and it also comes with a 2 year warranty.